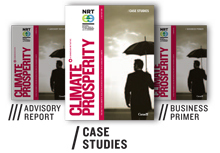 The capacity of and actions by businesses to adapt to the impacts of changing climate conditions — both average and extreme — will shape Canada’s future economic prosperity. Businesses of all sizes, in all regions, and sectors will face both direct and indirect impacts to their business from climate change. And, since we live in a global economy characterized by lean inventories, long supply chains, and just-in-time delivery, impacts on one business have cascading consequences on others. Proactive planning for climate change can limit downside risks and help take advantage of commercial opportunities posed by the irreversible effects of greenhouse gases (GHGs) already in the atmosphere. Yet relatively few companies appear to be taking a structured and explicit approach to incorporating climate change risk management and adaptation into regular business activities. Canadian businesses are already thinking about and acting on GHG emissions mitigation and carbon management, but they allocate far less attention to adaptation. 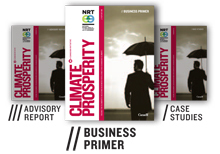 Facing the Elements: Building Business Resilience in a Changing Climate (Advisory Report) — the fifth report in the Climate Prosperity series by the National Round Table on the Environment and the Economy (NRT) — emphasizes the important, yet largely unexplored, role of Canadian business in defining our ability to prosper in a warming world.